What Are Side Effects of Eating Seaweed? Seaweed may help improve blood sugar control and decrease your cholesterol levels, according to a study published in "Nutrition Research and Practice" in 2008. Check with your doctor before taking seaweed supplements or eating large amounts of seaweed, however, because it can cause side effects and interact with certain medications. Some people experience mild to moderate side effects when taking supplements containing seaweed. In a study published in "The American Journal of Clinical Nutrition" in 2012 on seaweed supplementation and weight loss, some participants dropped out due to abdominal pain, bloating, nausea and diarrhea. The abdominal pain among the treatment group decreased over the course of the study as people got used to the supplement. Depending on the type of seaweed you choose, it could be quite high in iodine. The tolerable upper intake level for iodine for adults is 1.1 grams per day, but some types of dried seaweed can provide as much of this mineral as 4.5 grams in a 1/4-cup serving. Too much iodine could cause you to develop an enlarged thyroid, called a goiter, by increasing the amount of thyroid-stimulating hormone your body produces. It can also cause skin problems, including an acne-like rash, and gastrointestinal issues, such as nausea, diarrhea and vomiting. Pay close attention to the sodium content of your seaweed, as some types or brands can be high in sodium, which could increase your risk for high blood pressure and heart disease. For example, one brand of dried seaweed provides 312 milligrams of sodium per 1/3-cup serving, which is 13 percent of the daily value. Supplements can be particularly high in sodium -- the supplement used in the "AJCN" study contained slightly more than 1 gram per dose, which uses up two-thirds of the American Heart Association's recommended limit of 1.5 grams per day. If seaweed grows in waters with high levels of arsenic or other heavy metals, it can absorb these metals. Getting too much of them in your diet over time could be deadly. Watch for preliminary symptoms of heavy metal poisoning, which include numbness, tingling, weakness, nausea and diarrhea. Brown seaweed and the black seaweed called hijiki may be more likely to be contaminated, according to the European Food Information Council. If you purchase seaweed supplements, look for those that have been tested and verified not to be contaminated with heavy metals. Most medications don't interact with seaweed, with the exception of blood thinners, including warfarin. 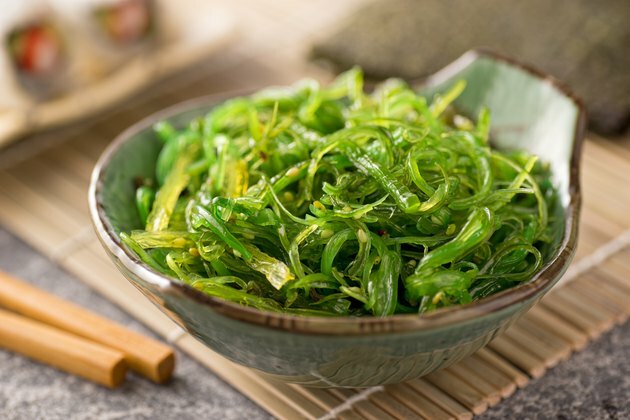 Seaweed can be high in vitamin K, and many blood thinners work by interfering with the actions of vitamin K. Increase your vitamin K intake, and you may also need to increase your medication dosage for it to remain effective. Do Fish Oil Pills Contain Iodine?